Refugees are displaced by a variety of causes: warfare, climate change, instability, shortages, and more. While a variety of domestic and international organizations are dedicated to helping refugees globally, many remain in temporary camps, trapped in unsafe situations, and/or unable to connect with family. In the private sector, some organizations – public, private, big, and small – have made it a priority to help refugees. 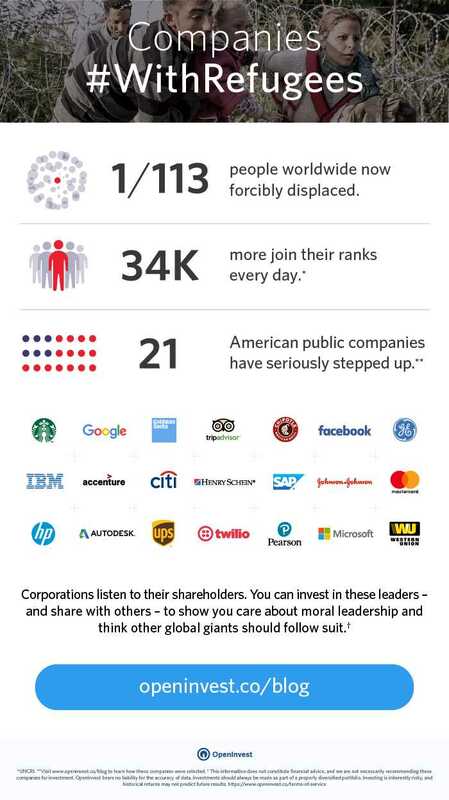 OpenInvest has conducted research identifying 21 public companies in America who have stood up, making significant contributions to refugee welfare, including hiring, funding, and in-kind services. The #WithRefugees screen is based on extensive research, drawing on data from the Obama White House’s 2016 “Call to Action” commitments; mainstream media, foundation, and NGO reporting and public filings; company websites; and discussions with a number of leading refugee relief organizations (Refugee Council member agencies). (The list excludes contributions made by foundations that are now fully independent from their corporate origins/namesake, and also Donor Advised Funds (DAFs) which serve as a legal vehicle for the contributions and charitable decisions of others.) If you select this screen, OpenInvest will favor the companies most dedicated to helping refugee populations when constructing your portfolio.